We're starting an experimental page of book reviews, in the hopes of sharing the work of other writers whose books have inspired, amused, informed, or otherwise provided sensory, practical or intellectual value to us. The first review is an emotional journey made by two sailors familiar to many of us. We hope you enjoy the review, and perhaps you'll enjoy the book, too. Update, January 2013: Amazon chose Bull Canyon as one of their Kindle 100 Books for January. You can buy it this month for $2.99. “What have I gotten myself into?” is a good question for a character to ask in a work of fiction, but when it’s 100 percent true, paired with a chapter called “An Introduction to Reality” and is written by one of my sailing heroes, I’m hooked. Ten miles up a rough winding canyon road, there are holes in the roof, holes in the water tank and holes in the garden fences, but no holes in this story—it’s a nostalgic memoir with sharply etched characters and vivid descriptions of events that are so well told I found myself standing alongside the Pardeys in howling wind and rain, mental shovel in hand, yelling “Put me to work, too!” One of my favorite vignettes was a debate with a rodeo bull rider who thought life at sea was far more dangerous than his own job! And throughout all this middle-of-nowhere, homesteading wilderness story of hardship, a wooden boat is being built. Taleisin’s origins in this rugged California canyon, the Pardeys’ temporary home while building her, were as unique as it gets. You’ve heard the stories about building boats in basements or garages that later had to be torn apart because the boat wouldn’t fit through the doors—well, the trip down the mountain road with the brand-new boat atop a big truck was not only heart-stopping, it was also heart-breaking. Not one of their land-based friends accompanied them to the launching, but a huge community of sailors was there to welcome them. What a stark portrayal of the divide between land-dwellers and deep-sea sailors. Despite its remoteness, Bull Canyon was still not far enough from distractions, and eventually Lin and Larry found a rather original solution to stem the tide of visitors. Before they did, though, the ways they handled this torrent of friends, relatives and gawkers revealed the differences between Lin and Larry, in their attitudes about people, work, and self. The emotional storms of life in Bull Canyon were far worse than any storms they’d ever faced at sea, and Lin’s account of the strains on their marriage from outside pressures is more honest than most writers would admit to. For one of sailing’s most prolific and most experienced writers, Bull Canyon is a radical departure from the competent how-to style so many readers have come to expect. Instead, it is a richly told tale of one big chapter in the emotional lives of two sailors whose adventures have inspired small-boat voyagers since the 1970s, and who have served as mentors to so many. Other books by Lin and Larry Pardey are listed on their web page, at Paradise Cay Publications. 3. It’s hilarious. I almost never laugh out loud while reading a book, but Riley’s commentary drew guffaws. Recipes are well organized in boat-friendly categories such as Breakfast, Bread Making, Seafood, Rice-Based Meals, Bean-Based Meals, Veggie Dishes, Candy Making, Snacks, Salad Dressings and Sauces. The book also includes a listing by the amount of cooking time it takes for each dish, much appreciated when ropane supplies are low. Recipe titles are intriguing, too: Pacific Cruising Bread (made with seawater,) Barbecued Shark, Sugar-Fried Fish (can’t wait to try that,) and Tahitian Coconut Rice sound good, but have you ever read a novelty recipe that made you seriously want to try it? Until now, I haven’t, but these sound good: Gooseneck Barnacle Finger Food, Sea Cucumber Jerky, Chiton Stir Fry, and even Giant Humboldt Squid Chips (if we ever catch one of those suckers.) Then there are the desserts: I dare you to make the one called Do What You Want With Me, and if that doesn’t suit your mood, try Murder on the Brownie Express. 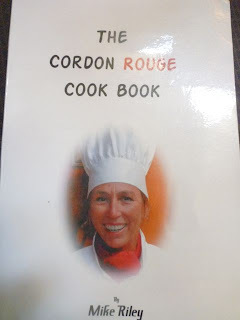 There’s even some history in The Cordon Rouge Cook Book: I never knew Buttered Oranges were invented by Nell Gwynne in 1664, or how they catapulted her from poverty into the arms of King Charles II, but there you are. And they sound fabulous. One tiny criticism: While typos are rarer in this volume than in most self-published books, there a few. But Riley is onto something here: this isn’t just another cookbook aimed at The Little Galley Slave, it’s a manifesto of humor and darned good recipes that’s likely to get men and women on boats arguing over who gets to cook tonight. Although he’s going to make The Cordon Rouge Cookbook available on Kindle one of these days, don’t wait for that. Mike Riley and his wife Karen will be glad to send you a copy from wherever they happen to be, which right now is French Polynesia. Email them at the address above, and when they find an internet connection, they’ll respond.